A man’s detention in a makeshift Moroccan prison serves as a beautiful metaphor for the country’s history. Feel through the darkness with Aziz, who is being held in detention; bits of cloth, a nail, a spattering of blood, a bone. He lies imprisoned in a kitchen awaiting his own death amidst the rot of others who have passed before him. A Rare Blue Bird Flies With Me centers on Aziz’s first-person confrontation with imprisonment, while other characters, also in first person, take turns relaying their encounters with Aziz. This multiple-narrative approach is an Arab literary technique that takes you intimately into the mind of each character. Birds, whether in the cell, in memory, or out in the open, symbolize Aziz’s captivity and personify his experience. This dark narrative pricks with literary light from a crack in Aziz’s cell, and in his own being, too. The metaphor is how Youssef Fadel chose to capture Morocco’s infamous “Years of Lead” in the 1970s, and specifically the failed coup against King Hassan II in 1972. 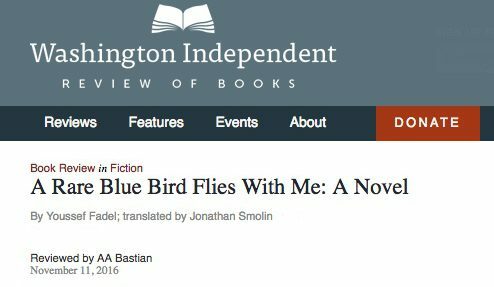 AA Bastian reviews Youssef Fadel’s A Rare Blue Bird Flies With Me (Hoopoe, 2016) in the Washington Independent Review of Books (November 11, 2016). Click here for the complete article.